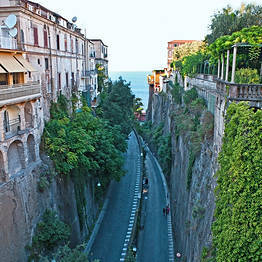 The center of Sorrento, Italy is quite compact, close to the traffic and easy to explore on foot. Here is a self-guided Sorrento tour itinerary which includes the most interesting sights in town and can be completed in just a few hours. The most obvious place to begin your walk is Sorrento's main piazza, named for the Italian poet Torquato Tasso who was born in this coastal town. In one corner of the piazza, behind the stand where horse-drawn carriages pick up passengers, there is a statue dedicated to this famous native. In the center of the piazza, instead, you can see the statue of Sorrento's patron saint, Saint Antonino...the city celebrates his feast day each year on February 14th. Piazza Tasso isn't a particularly historic square...it dates back only about a century. It was built above the gorge which was once home to a number of mills. In the 1800's, instead of cafés and shops, you would have seen local women hand-washing their laundry in the stream which ran from the hills behind down to the sea below. If you look down from the Piazza, you can still see the gorge known as the Valley of the Mills and, at the bottom, a number of abandoned mills which were powered by the force of the rushing water; unfortunately, the mills are closed to visitors. Piazza Tasso is the most popular place to stop for a coffee and people-watch in Sorrento! Instead of taking Corso Italia from Piazza Tasso, pass behind the statue of Torquato Tasso and walk down Via della Pietà. This road is part of the old town of Sorrento, which was laid out in a grid pattern. There are a number of examples of Medieval architecture which still stand along this road, including Palazzo Correale and the Church of Santa Maria della Pietà next door; further along you can also see Palazzo Veniero and the porticoes of Vico Galantario. At the end of Via della Pietà, you'll find yourself in front of Sorrento's Cathedral, a Baroque-style building where an antique Nativity scene from the 1700's is on permanent display. Continue your walk down Corso Italia, lined with fashionable shops and boutiques. Along the way, you'll pass Villa Fiorentino, headquarters of the Sorrento Foundation where exhibitions are often held. Over the past few years, shows of works by Dalì, Picasso, and the Italian sculptor Pomodoro have been held here. Once you have walked the length of Corso Italia, turn right and then right again on Via San Cesareo, one of the most charming historic streets in Sorrento and lined with artisan workshops. Along this street, you'll pass Sedil Dominova, easy to spot with its imposing frescoed cupola. This was once a social club where the high society of Sorrento would meet, and is now the headquarters of the Società di Mutuo Soccorso. Each Christmas, a traditional Neapolitan Nativity scene is on display here. Take Via Reginaldo Giuliani down to the Villa Comunale. Sorrento's Villa Comunale is a large terrace overlooking the Gulf; directly below the tufa cliff you can see the beach clubs in Marina Piccola and the port beyond. The elevator taking passengers down to Sorrento's port departs from here. 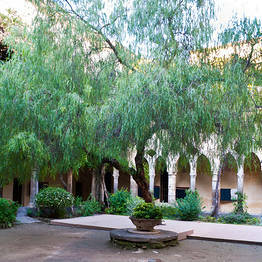 There is a small Medieval cloister dating from the 1300's next to the Villa Comunale, often used for weddings. Upstairs, there are often art and photography exhibits. From here, you can either return to Piazza Tasso passing through Piazza Sant'Antonino, or continue your walk to Marina Grande. After leaving the cloister, walk past the Hotel Tramontano to Piazza della Vittoria, another scenic overlook. Take the road which which begins at the entrance to the Bellevue Syrene hotel and walk down to Marina Grande passing beneath the historic city gate. Marina Grande is Sorrento's fishing village and the favorite spot for tourists and locals alike for a seafood meal on the water's edge. If you would rather not walk back up the steep cliffside, you can catch a bus from here back to the center of town. If you would like to explore Sorrento with an expert guide who can share with you all the town's history and culture, you can book a Sorrento Walking Tour online.